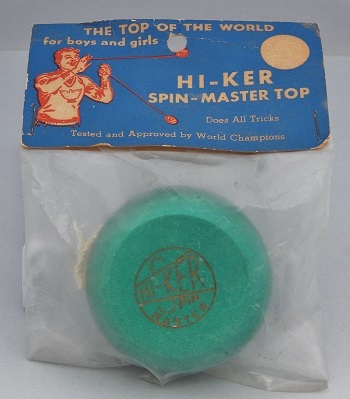 A 1950’s era Hi-Ker Spin-Master Top with a metallic teal-green paint finish. It’s a standard-sized wooden yo-yo with a tournament shape and gold die stamped seal. The return top is secured in its plastic bag by its original staples.